The number of freelancers to show up in the past couple of years have grown immensely, and so have freelance sites. Finding work as a freelancer without any connections is a difficult task, and small businesses have trouble finding competent people to hire that don't cost a fortune. But with the arrival of these freelance sites, you find common ground for both freelancers and employers to meet. 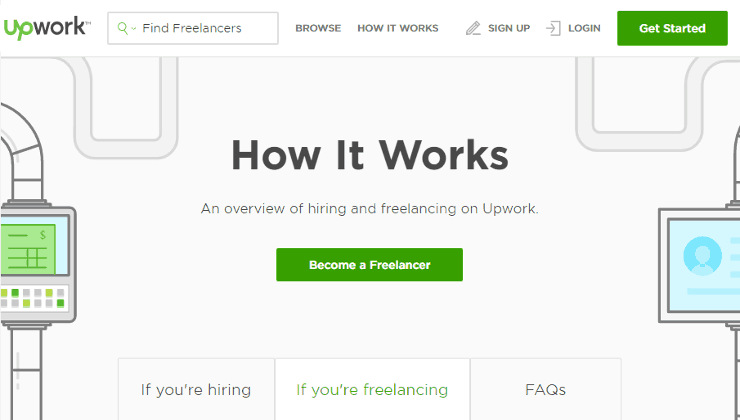 One of the most popular freelance sites is Upwork. Upwork is a middle man. They help freelancers find the right job and help business owners find the right person for the job. Signing up is free. They charge you a service fee once you start earning. These fees are a little tricky so let's talk about them later. No matter what your niche is, you're going to find work that suits you. Upwork has over 70,000 jobs up for grabs in categories like Engineering & Architecture, Web, Mobile & Software Dev, Admin Support, Sales & Marketing, Writing, Translation, Customer Service, and so much more. The great thing about it is you can choose which jobs you want and get paid for working without leaving the comfort of your home. You also choose whether or not you will get paid per project or per hour. Just complete your profile and Upwork will give you recommendations based from that. You can also search for jobs yourself and pick from the categories to find them quicker. Upwork job postings are incredibly detailed. Once you find the one you like, you enter your hourly rate, cover letter, answer some questions, and optional file samples of your work. This is called submitting your proposal. You get a profile and an opportunity to create a decent proposal for clients to see how qualified you are for the job. Upwork also gives you ratings and all sorts of programs to help increase your visibility and the trust that clients can have with you. As soon as you're ready to work, Upwork will give you a workspace to share wth your client. You can now chat with your clients and make agreements as to the job and payment details. You can also send and receive files from each other and have all those files in one secure environment. Upwork has a desktop app that includes their Work Diary. This ensures that you are going to get paid for the work that you do for hourly projects. 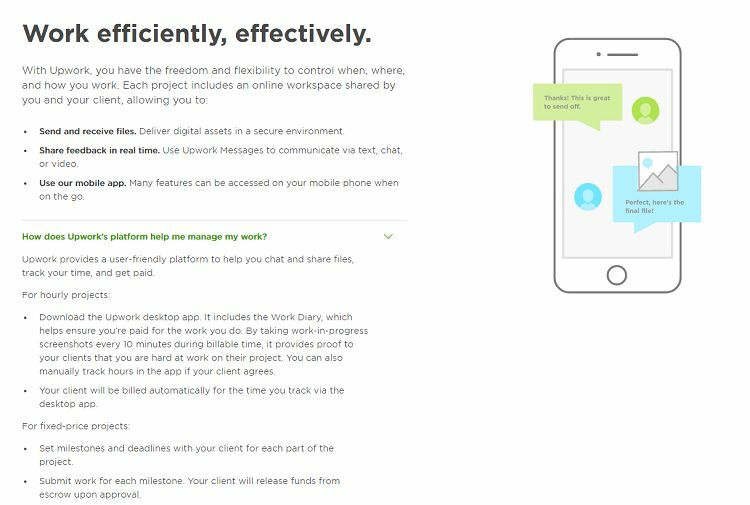 The Work Diary tracks your time and takes screenshots of your projects every 10 minutes to provide your clients with proof that you are working on the project. The good thing about this is that your client gets billed automatically for the time you've done that the app has tracked. It's not as easy with projects with a fixed price. You have to set milestones and deadlines for several parts of the project. After submitting work for a particular milestone, your client can then release the funds from escrow. They also have a mobile app for you to chat with clients, search for jobs, and check on the progress on your account on the go. Upwork's pricing scheme is supposed to encourage freelancers to have longer relationships with clients. Basically, the more you work with a specific client, the less you have to pay Upwork. It's thoughtful. But also the bane of many freelancers who are on the platform. You get charged 20% for your first $500 bill with a client. Moving forward, and beyond $500, the charge goes down to 10%. If you exceed $10,000, then it's down to 5%. I have to say, that even though it's nice that you get rewarded for staying loyal with a client, it's not always ideal. Some clients will have just that one project that's suitable for you, and having to pay 20% of your earnings to them is a big deal. This is one of the reasons why a lot of freelancers protest the 20% service fee. Upwork's customer support is not the best, and their performance has been dwindling the past couple of years. There are many complaints online about disputes not being settled and being given several different information as to what will happen with their specific complaint. If you have a problem with a client, I suggest you both find a way to settle it without getting their customer support involved. If you're thinking about becoming a freelancer, or you already are but you're having a hard time finding work, give Upwork a look. It's free to sign up, and it's a good way to get familiar with the freelancing world.